Supply chains fall under a number of laws and industry standards. One of them is the Electronic Records and Signatures Regulation (ERESR), also known as FDA 21 CFR Part 11. This law has been around for over 20 years yet is still often misunderstood. Complying with ERESR can seem like a lot of hassle with little benefit if you have good processes in place for maintaining paper copies of your records. In fact, it is an opportunity to revamp your data collection procedures to make them less costly, more useful and easier to capture through automation. The idea may seem to be about information collection, reporting and surviving inspections on the surface; however, moving to electronic records, including information from IoT technology, can be a real competitive advantage. ERESR specifies how the Food and Drug Administration (FDA) considers electronic records and signatures as valid as their paper versions by regulating how they are created and maintained. In some cases, a company might think it is complying by keeping paper records and calling them their “master” versions. In fact, as soon as a copy of a record is transmitted or stored electronically, that record becomes an electronic record under the rule; filing the paper copy does not change the record’s status as “electronic.” In addition, it is necessary to validate the records to make sure the electronic copies match the paper originals. Even small businesses must comply with this law, including keeping detailed documentation to prove their compliance. The FDA requires a record-keeping manager and an internal auditor to ensure that records are valid, accurate and not falsified. The FDA on 24 hours’ notice, without cause, can inspect any of these files. However, the cost of compliance is not as daunting as it first appears. What company could survive these days keeping records only on paper? If operations fell under Federal regulations, would they use electronic storage solutions that don’t provide the basic capabilities of time stamps, who created or changed it and system security to help determine that records are valid during an audit? Complying with ERESR should be similar to a company’s existing business practices in the first place. With the right technology solutions, many of the compliance costs shrink after the initial investment—and the benefits can be substantial. Specifically, the connectivity of Internet of Things (IoT) offers ways to track products, including perishable foods, throughout the lifecycle. The solutions automatically saving detailed records to cloud-based applications that make reports available for audits and other needs, often on demand. For example, when in-transit low-powered Bluetooth tags attached to pallets or crates provide real-time insight into the location and environmental condition of food from origin to destination. 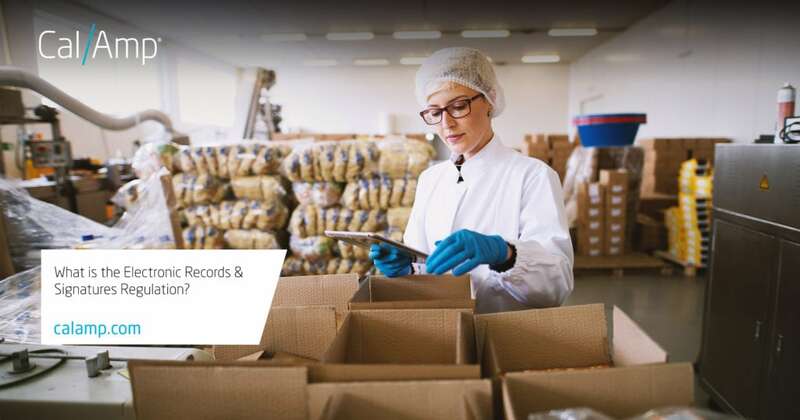 With an ERESR-compliant reporting and record-keeping solution, authorized personnel have access to historical records as well as situations that may be occurring that day. Analyzing past events helps companies refine processes and prevent future mishaps. IoT technology enables a company to be nimble while better managing both risk and operational cost. For more information about how CalAmp can help you comply with ERESR, visit our supply chain visibility and risk management page here. In the past, it was difficult to monitor conditions when shipments were in route. Emerging technology in industrial IoT is changing the way we track environmental conditions.